Read more at Tech Today, by VPR. The concert celebrates Earth Day with music inspired by nature or includes themes relating to the natural world. The Michigan Tech Concert Choir will perform music from Haydn’s “Creation,” paired with a setting of poetry of George MacDonald, titled “Communion,” by René Clausen. ConScience: Michigan Tech Chamber Singers will premiere a new work by Elizabeth Meyer (VPA), titled “To What Listens,” for choir, trombone, piano and percussion. Other selections include two choral soundscapes, “Tundra” by Ola Gjeilo and “The Whole Sea in Motion” by Dale Trumbore. Another set, titled “Flower Songs,” will feature the music of Chen YI, John Clements and Carlos Guastavino. The show will be at 7:30 p.m. Saturday, April 23, 2016, at the Rozsa Center for the Performing Arts. 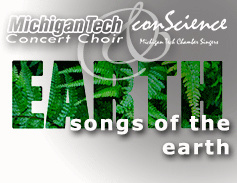 Tickets for “Songs of the Earth” are on sale now, $13 for adults, $5 for youth and no charge for Michigan Tech students with the Experience Tech fee. Tickets are available by phone at 7-2073, online or in person at the Central Ticket Office in the Student Development Complex. Today, April 22, 2016, marks the 46th anniversary of Earth Day. It was established in 1970 by Wisconsin Senator Gaylord Nelson, in response to massive oil spills and growing environmental hazards from industrial pollutants. Earth Day is an international observance with more than 192 countries working together to find solutions for our world. From education in the schools on green solutions to Adopt a Highway programs, there is something each of us can do to join the campaign to protect the planet. Michigan Tech is presenting the Rozsa Center season’s final concert titled “Songs of the Earth,” a musical presentation inspired by nature at 7:30 p.m. tomorrow (April 23). Read more at Tech Today, by Mary LaDoux, Student Writer. 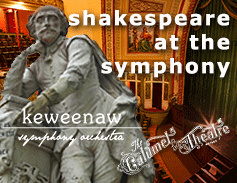 The Keweenaw Symphony Orchestra returns to the Calumet Theatre to commemorate the 400th anniversary of Shakespeare’s death. The concert takes place at 7:30 p.m. Saturday, April 15, 2016, at the Calumet Theatre. The KSO performs orchestral music inspired by several of the Bard’s plays, including “The Tempest” (Sibelius), “Hamlet” (Berlioz), “A Midsummer Night’s Dream” (Mendelssohn) and “Romeo and Juliet” (Berlioz and Prokofiev). Tickets are on sale now, $19 for adults, $6 for youth, no charge for Michigan Tech students with the Experience Tech fee. Tickets are available by phone at 7-2073, online, in person at the Central Ticket Office in the Student Development Complex or at the Calumet Theatre Box Office. 49 years of great jazz and counting. Join Jazz Studies Program Director Mike Irish and the Michigan Tech Jazz ensembles for the 17th Annual Don Keranen Memorial Jazz Concert at 7:30 p.m. Friday, April 15, 2016, at the Rozsa Center for the Performing Arts. In 2003, Jay Keranen developed an endowed award program in his father’s name. Two $500 amounts are awarded for Outstanding Jazz Musician and The Most Improved Jazz Musician. This year’s recipients will be announced during the evening’s concert. 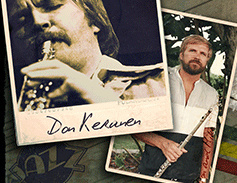 Tickets for the Don Keranen Memorial Jazz Concert are on sale now, $13 for adults, $5 for youth and no charge for Michigan Tech students with the Experience Tech fee. Tickets are available by phone at 7-2073, online, in person at the Central Ticket Office in the SDC or at the Rozsa Box Office the evening of the performance. Note that the Rozsa Box Office only opens two hours prior to performances. “Pageantry” is an evening of music created for large celebrations! From the music of Charles Gounod and John Philip Sousa to John Mackey and Winton Marsalis, come listen to music designed to make you feel the grandness and the thrill of important occasions. Never been to a Superior Wind Symphony concert? It is the only Michigan Tech music ensemble composed entirely of non-music majors: chemists, engineers, physics, even math majors, make up the band. 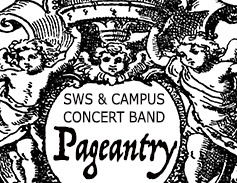 Come to the “Pageantry” concert this at 7:30 p.m. Saturday, April 9 in the McArdle Theatre, and enjoy the show. Tickets for “Pageantry” are on sale now, $13 for adults, $5 for youth and no charge for Michigan Tech students with the Experience Tech fee. Tickets are available by phone at 7-2073, online, in person at the Central Ticketing Office in the SDC or at the McArdle Theatre door the evening of the performance. The Tech Theatre Company presents “The Winter’s Tale” by William Shakespeare this week. One of the Bard’s later plays, it is a comedy which also provides intense psychological drama. “The Winter’s Tale” follows the story of two kings, childhood friends Leontes and Polixenes. The plot involves jealous rages, seeming betrayals, accusations of infidelity and Leonte’s refusal to accept his wife’s child as his own. Eventually, love reunites the characters in the end and all are redeemed. “The Winter’s Tale” will be performed at 7:30 p.m. Thursday, Friday and Saturday nights, with a 2 p.m. Sunday Matinee at the Rozsa Center for the Performing Arts. Tickets are $15 for adults, $6 for youth and Michigan Tech Students are free with the Experience Tech Fee. From Tech Today, by VPA. The curtain will go up tonight for the Tech Theatre Company’s latest production, “The Winter’s Tale,” in the Rozsa Center for the Performing Arts. Curtain time is 7:30 p.m. tonigh (April 7, 2016)t, tomorrow (April 8) and Saturday (April 9) with a 2 p.m. Sunday (April 10) matinee. 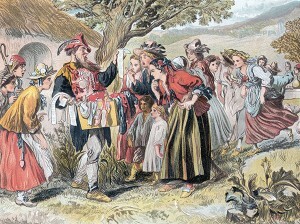 Published in 1623, “The Winter’s Tale” is one of Shakespeare’s later plays. Considered a comedy, it is also sometimes labeled one of the Bard’s late romances. Providing both intense psychological drama and comedy, “The Winter’s Tale” leaves audiences with a romantic and happy ending as it follows a story of two kings who are childhood friends. There are violent storms, an insistence to abandon a child and even 16 years pass before love reunites the characters in the end and all are redeemed. General admission is $15, youth tickets (17 and under) are $6, and Michigan Tech student tickets are free with the Experience Tech fee. To purchase tickets, call the Central Ticket Office 7-2073, go online or visit Ticketing Operations at the SDC. Tickets will also be available at the Rozsa box office two hours before each show.